A humanist funeral is a non-religious service that is both a dignified farewell and a celebration of a life. It recognises the profound sadness of saying goodbye whilst celebrating the life and legacy of a loved one. The celebrant will work closely with the family to create a unique and personal ceremony. A typical funeral often includes pieces of music and readings. But the heart of the ceremony is the tribute section, which lasts up to 15 minutes and might be written by the celebrant and/or include a variety of tributes paid by family and friends. Time for reflection follows, then the committal, and the funeral is drawn to a close with final words of thanks. You may want to have a look at a typical structure of a humanist funeral. Where are humanist funerals held? Funeral ceremonies have no legal status in themselves so you are free to hold one wherever you choose. That said, most humanist funerals are held at crematoria, cemeteries or woodland burial sites. Our celebrants will meet key members of the family, often for several hours, to find out about the person that has died and discuss options for the ceremony. They then write a unique script based on this information and the family’s preferences. Do you have a set script? Absolutely not. We are proud that each funeral ceremony we help to create is unique and crafted to reflect the individual concerned, so as to ensure a fitting and sincere way of remembering them. You can do this one of two ways. Often, your funeral director will be able to recommend someone, but do check that they are accredited by Humanists UK. Alternatively, you can contact a celebrant directly and tell the funeral director (if you are using one) who will be conducting the ceremony. 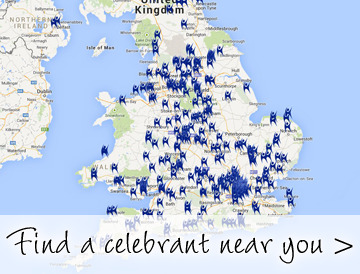 Our find-a-celebrant search facility enables you to search for all Humanists UK accredited celebrants working in your area: just enter your postcode and you’ll be given a list of people you can contact. You can then select one or more people to contact to ask about their availability, etc. I’m not sure we could have called Dad a humanist as such, but he certainly wasn’t religious. Can we still have a humanist funeral for him? Absolutely. In fact, only a small number of our funerals are held for people who would have described themselves as a ‘humanist’ – the vast majority are for people who lived their lives without religion because they didn’t believe in God or weren’t clear about their beliefs. Why do people choose a humanist funeral? Time and time again we are told that our clients chose a humanist funeral because they had been to one previously and were impressed by how meaningful and personal it was. People also choose a humanist funeral because they feel it will most accurately reflect the personality and outlook of their loved one, saying a religious service would have felt hypocritical or inappropriate for the person involved. Some of the family are very religious and I don’t want them to be offended or feel excluded. Will a humanist funeral ceremony be okay? Yes – and we know that religious people find humanist funerals just as moving and meaningful as those who aren’t religious. We recognise that every funeral will be attended by guests of different faiths and of none, and feel that everyone present should feel comfortable and involved. In particular, we always include a time for personal reflection which is an opportunity for those who wish to do so to pray. I don’t really know any poems or prose and can’t imagine anyone wanting to read anything. You don’t have to include anything in the funeral that you aren’t comfortable with and that certainly includes readings. That said, there are a surprising number of great readings and poems that are suitable for non-religious ceremonies. Your celebrant can advise you on this and perhaps make some suggestions, and will be happy to read anything themselves if you do wish to include something. How long does a humanist funeral last? This depends on the time available (crematoria run to strict schedules, for example) but on average around 20 minutes to half an hour. If you want a longer ceremony at a crematorium you can book a double appointment – your funeral director will advise on this. How much does a humanist funeral ceremony cost? Humanist funerals are priced very similarly to other funeral ceremony providers. Our recommended fees are £150-£280 but you can check the exact fee with the celebrant beforehand. Do you allow any religious content? Whilst our ceremonies are non-religious, we recognise that there are aspects of religious reference embedded in our culture and day-to-day experiences. For example, certain hymns can remind people of their youth or even of their favourite rugby team. We are happy to include such content where they help reflect the person, but not as an act of worship. I’d like to plan my own funeral. Can you help? Yes. Please see our page about this here. How are you different from other celebrants? Each one of our accredited celebrants is a part of a growing national network covering England, Wales and Northern Ireland. All are insured and have professional indemnity. Our celebrants are rigorously trained, accredited, quality assured and regulated by a code of conduct. Celebrants also undergo continued professional development to ensure they uphold the highest standards, undertaking their work with compassion and dignity. Yes. We conduct a growing number of memorial services held at a variety of venues. Sometimes this is for practical reasons; perhaps the person died overseas or a very intimate funeral was requested. But whatever the reason, a memorial service can give a family more flexibility about how, when and where they say goodbye to their loved one.